The Overbrook Nature Center is a place where the outside is "in". The Overbrook Nature Center is the centerpiece for our nature programs at the SM&NC. Come and visit the exhibit area and pick up a map to explore our nature trails or meet there for an informative program with one of our naturalists. The Museum's trails are a great place to spend an hour, an afternoon, or even a whole day. Behind the Overbrook Nature Center you will find miles of beautiful walking trails that wind through over 80 acres of the property. Our nature trails are a perfect place to see abundant wildlife, stroll along our Wheel in the Woods trail, enjoy the sounds of the Poorhouse Brook, capture that perfect picture, read our interpretive educational signs, or simply take in the beauty that is the Stamford Museum & Nature Center. A walk along any trail may afford glimpses of wood duck pairs, signs of red fox and white-tail deer, or even a pileated woodpecker. 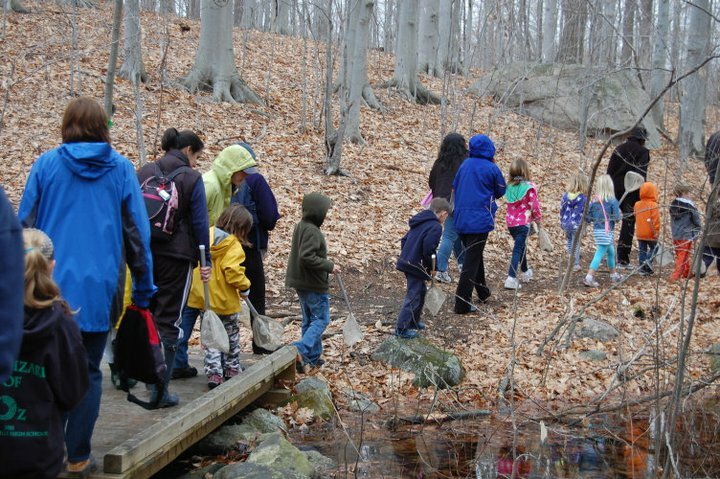 There are several vernal pools along the trails, home to wood frogs, spotted salamanders, insect larvae, and even a few snakes, turtles, and water birds. Spectacular glacial erratic boulders are strewn throughout the trail system which winds through a mature forest of American beech, oaks, black birch, and other native plant species. Visit our maintained woodland meadow, a great place to spot nesting eastern bluebirds or enjoy the beauty of spring wildflowers. Our trails connect with the 88 acre-Bartlett Arboretum on the north end of the Museum's property. Did you ever wonder what the world is like from an animal's point of view? Scamper through the giant hollow log into Nature's Playground and find out. 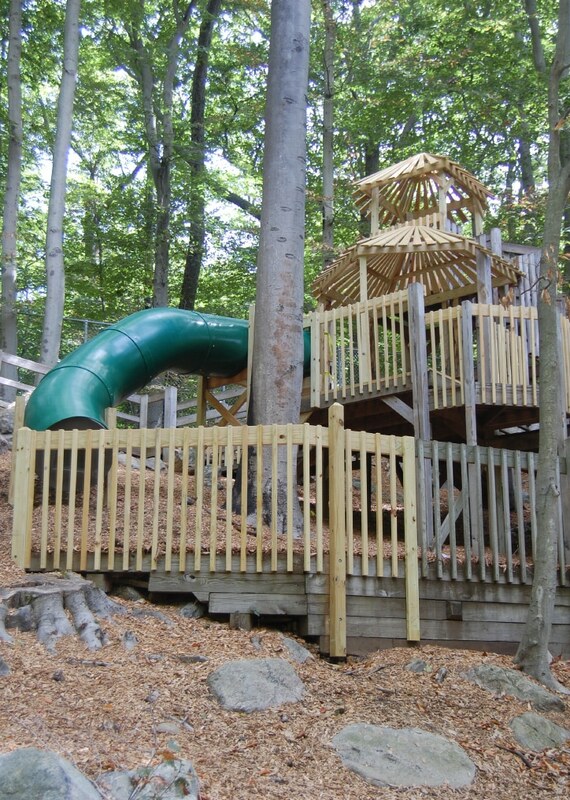 This exciting playground in the woods at the Stamford Museum & Nature Center is nestled into a rocky hillside. Kids (parents, too) can climb to a tree house with a lookout, then wind their way down a tubular slide or zoom down the otter slide. They can jump on a bouncing bug, try to walk across a moving bridge or climb into a hawk's nest to survey their territory. Wiggle like a worm across two huge maple leaves, and crawl through an ant's nest. Dig for fossils in the huge sand pit. They also can become the captain and crew of the boat that's anchored here. In the center of all these activity areas is a seating area with tables for picnicking or projects; benches also are built into the hillside - great for parents or teachers to rest while the children play. Beautiful landscaping with native plants and easy-to-walk-on paths is all part of the fun. From the playground, it's a short walk to the Stamford Museum Galleries and - check out the current exhibition!